Canine Aggression Issues with Jim Crosby: LIVE! From Nassau, The Bahamas. A day of life in paradise. Right. LIVE! From Nassau, The Bahamas. A day of life in paradise. Right. 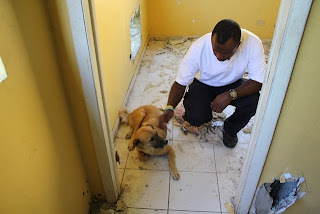 Those of you who are in regular touch know that I have spent the last six weeks or so here in Nassau, The Bahamas (yes, it is capitalized) working with the super folks at the Bahamas Humane Society (not capitalized in this instance. Yeah, grammer makes weird sense). As I have been here longer I have learned a lot about this tiny island nation, and have seen quite a bit that is, well, different than we see at home. So I am going to share my day with you today. 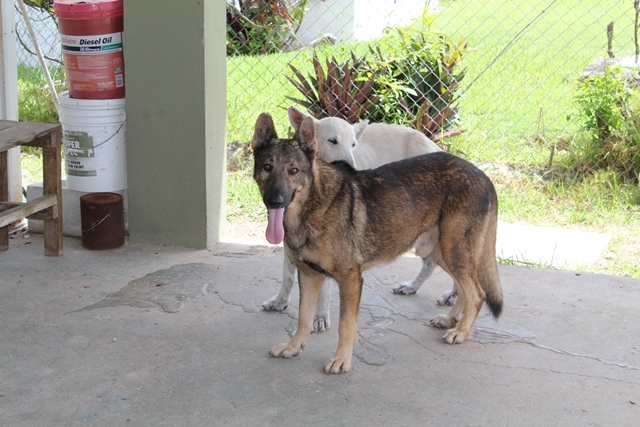 After settling in the first crisis was a German Shepherd brought into the clinic near death. This boy was severely overheated and unresponsive. The poor guy died almost immediately on arrival, too far gone and too damaged to be revived. The young police officer who brought him in was clearly distraught. He did his best when he found the dog and rushed him in to our clinic. Trouble was, he found the poor dog in a crate in the back of a police van. In the police lot. Under the supervision and control of the Bahamas Police. I was out on the road when the dog came in, but when I returned I had the body pulled from the cooler to make sure all details were documented. The dog, weight 54 pounds, had an internal body temperature, 35 minutes after death and after being in the cooler, of 110.4 degrees F. Normal body temperature for a dog hovers around 102 degrees. This poor guy had been cooked and died of a combination of the heat and asphyxia. The initial police account was that the dog had been turned over to the police for training. The dog was placed in the back of the van, probably on Sunday, left closed up in the heat and forgotten. An investigation is underway as the Police Superintendent has been notified. We will see what, if anything, happens next. 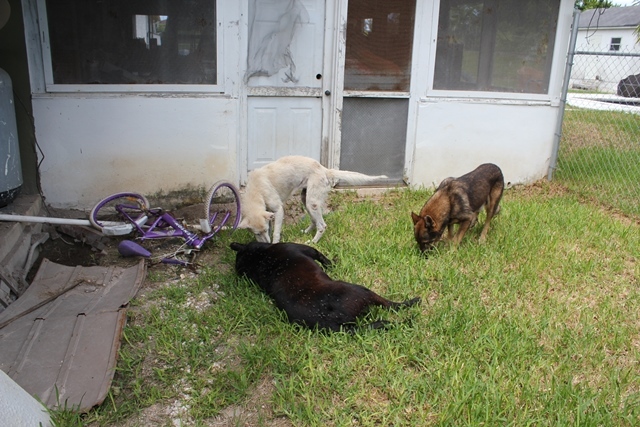 The next call was to a residence where neighbors reported two dogs in poor condition and a third dog dead in the yard. Ventoi and I rolled on that one in the Bahamas Humane Society Animal Ambulance. We found a fenced yard in the suburbs of Nassau with a huge chain link fence. Two German Shepherd dogs came barking to the fence. The residence was empty. One neighbor pointed out the dead dog laying, bloated, in the side yard. His two buddies look a bit lost. Why you not get up? We did contact a person in the area who had been trying to feed the dogs when she could. She related that the owner had been gone for a long time, whereabouts unknown. 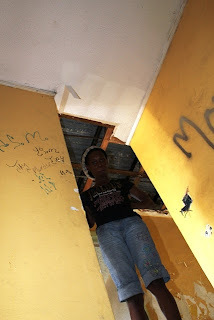 She had not heard from the property owner in some time, and the details of where the owner was and why were a bit cloudy. 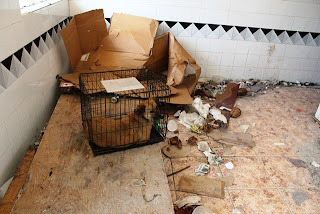 The conditions in the area the dogs lived in were less than ideal. Once they settled down the live dogs seemed to be ready for some company. A relative of the owner came up to us and we discussed the best option for the two live dogs. They decided to surrender these two pups to the BHS, and Ventoi made a friend. We also loaded up their departed friend to arrange proper and respectful disposal of his remains. The relative will be in touch with us (we hope). Until then we will be trying to nurse these guys back from poor nutrition and a severe infestation of ticks. Next call-a report that kids were hanging and torturing dogs in an old hotel in downtown Nassau. I rolled on that case with BHS Animal Care Manager Kirk Duncombe. We met our source near the hotel and hiked on in. This is what we found-and no, this is not Aleppo or Beirut. 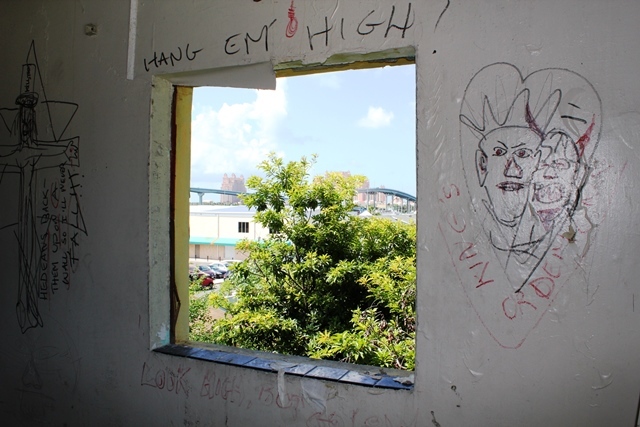 This is downtown Nassau, in easy sight of the fun-in-the-sun of Atlantis and Paradise Island. We entered the building and found what looked remarkably like a war damaged husk of a building. The dog we were seeking was on the second floor. She is a Potcake, a couple of years old. 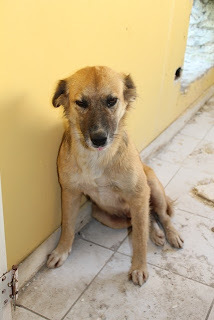 For those of you who have never met a Potcake, they are the indigenous dogs of the Bahamas, having resulted from generations of dogs imported from around the world and then marooned here to interbreed. They are the Caribbean version of the dogs found world wide living on the edges of, and often in the middle of, human civilization, making their way the best that they can. 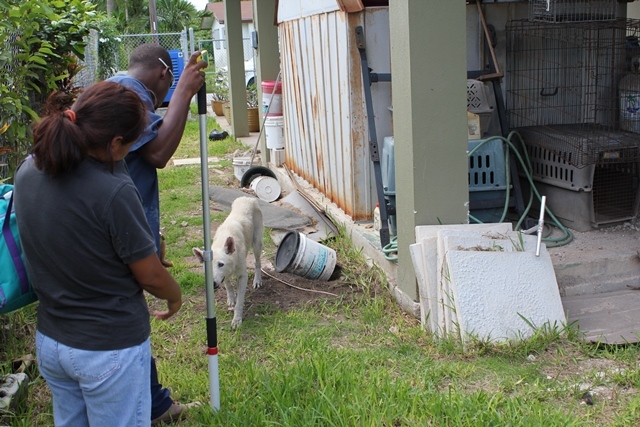 Although many live on the streets, programs like Operation Potcake and the Bahamas Humane Society have worked to spay/neuter and vaccinate a large number of these animals. For instance, during ten days in January, 2013, Operation Potcake sterilized 2315 animals in just ten days! Here is our little girl. A bit shy at first, she has not had great experiences with people before. She did warm up to Kirk after a few minutes of attention though. We gathered up our little friend and prepared to leave. Being the old cop that I am, and having been through similar buildings after Hurricane Katrina, I couldn't go without a sweep of the rest of the building. No taking chances that another friend in need might be hiding somewhere above. And on the upper floors I met Celine (not her real name). Celine is a refugee and is living in the shell of this crumbling wreck. She is making her way the best she can, along with her boyfriend. 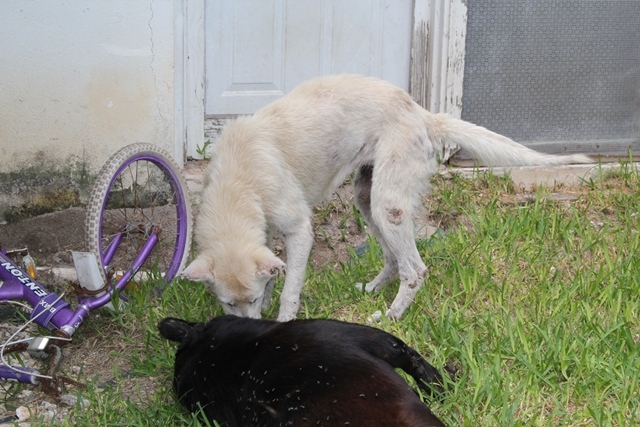 They have very little, and are not only struggling to feed themselves, but are caring for another of the resident dogs, a Potcake they have named Sheba. Sheba is one of the animals that were sterilized by Operation Potcake. Celine does her best to scrounge food for Sheba and give her company. Celine and Sheba also have a mutually protective relationship-Celine tries to protect Sheba from being victimized by humans, and Sheba gives Celine a warning system to alert her when strangers enter what passes for home. Chella, an animal advocate and rescuer in the area, left some food with Celine and Sheba. Although I did not find any clear evidence of animal abuse in the building, I did find some disturbing graffiti on the walls. Yes, that says "Hang "Em High" over the window. And yes, out that window we can clearly see the spires of Paradise Island's feature resort, Atlantis. This building is less than half a mile from the glitz and glamor of the largest tourist attraction in The Bahamas, and barely half a mile further from the high end shopping of Bay Street with its cruise ship crowds and Gucci storefronts. We left with our new friend and headed back to the BHS. There she got a nice clean crate, vaccines, a thorough Vet checkup, fresh water and a good meal. 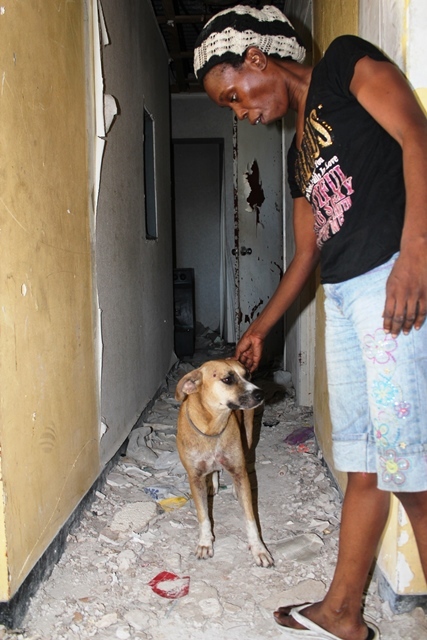 Correction: This poor girl is named Bridgett and was an Operation Potcake dog. She has already been spayed. She does have a leg deformity that has been revealed by the BHS's new digital x-ray machine, donated through the generosity of Lindsey Panning and Tony Hull. Treatment options are currently being discussed. The deformity is not life threatening (a bone grown off kilter) so she should be moving along to her foster family soon. By this time it was the end of the day and time to call it quits. The drive back to my quarters on the west end of the island passes by some of the most beautiful shoreline you would ever want to see, and I took the drive slowly to decompress a bit. Paradise it may be, but just under the surface are the same problems we face all over the world-animals in need, humans living on the edge, and conflict between those who place their own well being behind that of the animals they live with and those who would victimize both human and animal. We can only address so much at once. There have always been those who care and those who do not-or are even actively evil. The only thing we can do is try to affect our little corner of the world for the time we are there. This, for the moment, is my little corner. I will continue to work with the Bahamas Humane Society to address the many problems here, and if I am lucky I might leave this little corner just a little bit better than I found it.